When South Asia's only active volcano erupted in late May, residents still reeling from the tsunami in India's Andaman and Nicobar archipelago feared the worst. They saw it as evidence of fresh tectonic activity capable of generating more earthquakes. There is still the odd tremor, but the Barren Island volcano is now seen as one major attraction capable of reviving tourism to the islands and their stunning beaches and marine life. 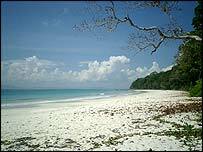 The Andamans were visited by more than 100,000 tourists in 2004 - up tenfold on a decade earlier - until the tsunami struck on 26 December. In the past six months, visitor numbers have plummeted. "We are almost back to where we were a decade ago," says Manoranjan Bhakta, the sole member of parliament from the Andamans. He says tourism was a key element of the island's economy and must be revived. So when the Barren Island volcano erupted after lying dormant for 10 years, the Andaman tourism department saw it as a godsend. "We are now using the volcano as a major tourist attraction for those willing to come to the Andamans. This is a sight most South Asians will not get to see easily," says tourism chief Rana Mathew. "So far most of those going to Barren are locals. But a fair percentage are tourists and their numbers are rising." A tourist boat now heads to Barren from the Andamans' capital, Port Blair, every Friday evening, with space for 150. Seats on the MV Long Island cost as little as 400 rupees ($9). A bunk is more than double that. After a night's sail, the vessel anchors about 300 metres from Barren Island at sunrise, with spectacular views of the volcano. "I have seen the tsunami and I will never forget it. I have now seen the volcano and it is a lifetime experience," says Geetesh Sarkar, who had been in Port Blair on business. "Nobody in my family has seen such a thing or will ever see such a thing." French tourist, Francoise, was ecstatic: "The volcano is simply fabulous. And the environment in the Andamans is pristine." 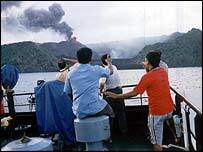 The Barren Island volcano last erupted in 1994. Late in May, Indian coastguards noticed smoke coming from it and geologists confirmed it was active again. Now lava is oozing out as well and flowing into the sea around the island. The crater has widened since the last eruption, say geologists. Many tourists have horrible memories of the earthquake and tsunami - of being stuck at the airport for days without much water or food. Now that Port Blair and Phuket have a twin-city agreement signed at the end of June, the local administration expects a rise in tourist charters to the Andamans from Thailand. "It will be a major boost to our tourism if only a small percentage of those visiting Phuket come to our islands," says Mr Bhakta, the MP. But environmentalists warn the local administration must guard against pressure on scarce local resources as it seeks to boost tourism. "Mass tourism will be dangerous for us. We should aim to bring in niche tourists like those who love nature and respect local sensibilities," says Samir Acharya of the Society for Andaman and Nicobar Ecology. Tourism chief, Rana Mathew, agrees. "We cannot keep out middle-class Indian tourists. But we want to go for a Bhutan-type, specific category tourism that will bring us income but not tax the environment," he says.